Dr. Daniel Nakano of University of Georgia will present his colloquium titled "Geometry, Cohomology and Combinatorics of Lie Superalgebras" on November 15 in DMSC 104. 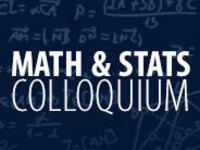 This event is put on by the Deaprtment of Mathematics and Statistcs. Lecture description: Let g be a (simple) classical Lie superalgebra over the complex numbers. In this talk I will give a survey of the developments over the past 10 years that have led to effective methods to systematically study these algebras via the construction of detecting subalgebras. The detecting subalgebras play an important role in the theory. They completely detect the cohomology relative to the even subalgebra, and provide a structural interpretation of combinatorial invariants that were defined by Kac and Wakimoto. Recently, the speaker with his collaborators have constructed parabolic subalgebras, b, (like Borel subalgebras) where the detecting subalgebras can be viewed as the Levi component. By comparing the cohomology of g and b, we discovered an important relationship with the Poincare series of an ambient complex reflection group via the Bott-Borel-Weil theorem. Furthermore, these Poincare series describe the higher sheaf cohomology groups of the trivial line bundle over G/B where g=Lie G and b=Lie B. At the end of the talk, applications will be given to verifying the conjecture due to Boe, Kujawa and Nakano on the realization of support varieties for g.
This talk represents joint work with D. Grantcharov, N. Grantcharov and J. Wu.